Regarding the issue of the Lord’s Supper being observed as a part of a meal, any discussion of it has to take into account the end of 1 Corinthians 11, where Paul says, “If anyone is hungry, let him eat at home, so that you will not come together for judgment” (v. 34). This is the command that has led almost all Christian churches throughout history to observe communion separately from a meal, because that’s what Paul says to do. A case could be made that he does so because of the specific situation of abuses in that church (vv. 18-21), so it is not a permanent command that applies to all situations, and therefore we have the liberty to observe the Supper as a part of a meal. But on the other hand, at the very least that verse makes clear that it is okay to observe it separately, and that it would be legalistic to say or imply that it must be done with a meal. 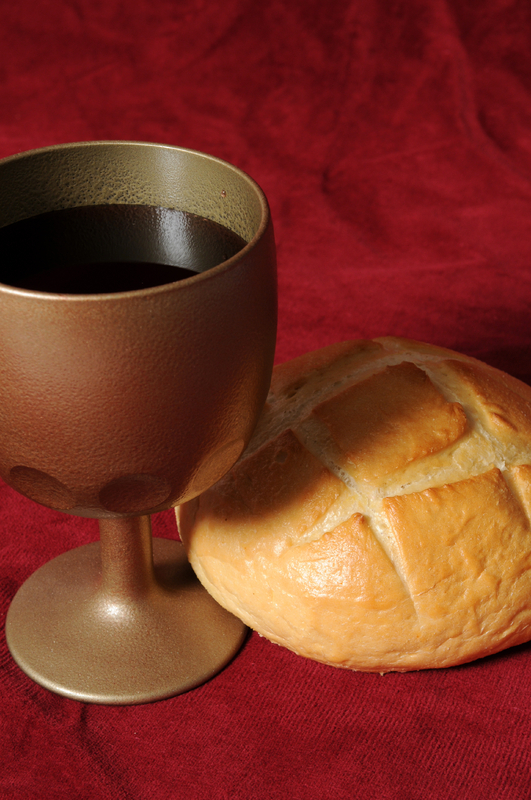 Also, I do not believe that the Bible forbids believers taking communion outside the services of the church (though we have no examples of that in the New Testament), but as long as we avoid legalism by making that clear, there is nothing wrong with a particular church making a policy about when it will be observed in their particular context. In fact, I think it is wise for the leaders of a church to give direction to people about this matter by deciding what will be practiced in the flock under their care. And I think there is some wisdom in the traditional practice of most churches (requiring that an ordained minister be present), because of the serious consequences of taking it “in an unworthy manner” (1 Cor. 11:27-32). That being said, I don’t know of any godly elders who would try to stop a couple or family who wants to partake of some bread and wine and remember Christ. Thank you for the interesting blog, and the opportunity to respond! I’m glad to see that for the most part we agree, and I thank-you very much for your comment. The picture of Jesus in Luke that I mentioned was in no way intended to say that churches do it wrong, or they need to do it my way, but I was trying convey the message that it could in deed be taken this way in your home. Obviously in the Corinthian church there were abuses and Paul addressed the issue, this does not take away from what I’m saying in respect to a comunion meal. I think for the most part we agree. As for denominational ‘handcuffing’, I think if you thought about it you would agree with me, at least on some level. Take for instance, a pastor experiences something of God in a way that contradicts his denomination’s theology, he knows that if he shares this openly he could be removed from his position, so he has two choices; first, share it openly and have faith in God to actually provide for him, or, second, hide it because he doesn’t want to lose his income and or support that comes from his denomination. You cannot say this does not happen, even you have changed your mind about how you believe (from baptist to reformed). How many others have changed their minds, but are ‘spiritually handcuffed’ to their theology, in fear of losing a position, salary, or their sheep. Thank-you for your interest, and know you are always welcome! Yeah, my point is that the “handcuffing” you are describing happens in independent churches also, so it is not as much of a negative about denominations as you think. My denomination does not pay me anything… I am paid through the offerings of the people in my church, like an independent church pastor. So like an independent church pastor, I definitely might hesitate to change a view knowing that some or many of my sheep might leave the church (though I hope I would do it anyway, if the Lord led me that way). But again, this is not unique to denominations or even necessarily any worse in denominations. In fact, I lost a job in an independent church one time because I decided to join a denomination! Maybe your point would be better made if you were comparing “confessional” and “non-confessional” churches (whether independent or not). In confessional churches, with a long and thorough doctrinal statement, the temptation you describe is more significant than in non-confessional churches that have few distinctives and a very short doctrinal statement. But in the latter case, there probably are more power struggles and politics because of the lack of unity at the leadership level, so there may be more of those type problems in a non-confessional church anyway. I never said or implied that independent or non-denominational churchs don’t have this problem, plus, I think that non-denom churches are a denomination. Personally, I will never be tied (handcuffed) to a denomination, or theology. I only tie myself to Christ, like I believe all christians should do. Is your denomination based on Christ, or is it an organization that is more of a business? I mean, what in the world does voting have to do with The Church Jesus is building? The eventual downfall of all denominations will come through this mindset that it is a business with by-laws and “constitutions”. Fah. Man-made religion is destined for the fire, and is tinder for the flame. My point about the vote thing is that being a part of our denomination is purely voluntary on the part of the people in the church. If most of the people want to leave, the church can leave. That’s all I meant to say, because “handcuffing” sounds like something involuntary being done to someone. Regarding your other point, remember that the Lord Himself set up an organizational structure for the church by talking in the NT about elders, deacons, discipline, ordination for gospel ministry etc. (not to mention all the organization of Israel in the OT). And He clearly implied that the leaders of the church would have to organize other matters for it to run well… I Cor. 14 says “Let everything be done decently and in order” and the fact that we are told to submit to our leaders (Heb. 13:17 etc.) implies that they will be making decisions about that order not directly found in the Word. Someone has to decide when we will meet, how those meetings will function, what are the requirements for teachers, what music we will sing, and so forth and so on. Those decisions that must be made on extra-biblical matters should never be allowed to become on par with Scripture itself, but they are matters of wisdom that are necessary for the “household” of the church (1 Tim. 3:15) to be in order. See 1 Tim. 3 where Paul compares leadership in the church to managing a household… if we don’t have any rules and structures in place in our families, they will not function well. So it is with the church, the family of God. Thanks for sharing and listening! God bless!! It appears the implication is that church is the only place or platform that endorses elders, deacons, etc. Not true. I have a pastor who counsels and shepherds me and this takes place far and away from organized and formalized Christianity. I have brothers who hold me accountable, and I have a family that I myself lead. 1 Corinthians 14:26 is, to me, what church should be. It is not about anything other than preparing us, as individual covenantal members, to actually do what our Jesus has taught us to do. As soon as people add to this brilliant Scripture, things go from being Spirit-led to being man-led. We don’t need organized programs or religious trappings to be a part of The Church or function as The Church. Gathering together, in Jesus’ Name, has been and always will be quite enough to accomplish this. Word. No matter how you slice it or pretty it up, denominations are merely man putting God’s Word under their own scrutiny for the sake of comfort, and putting Him into boxes of their own limited understanding. Blech. If I wanted any of that, I’d become a Catholic. Hey FW, I’m interested in hearing more about your last comments… What do you mean that non-denominational churches are a denomination? And I thought you are “tied” to Pastor Jim’s church (in membership)… Isn’t that a non-denominational church? If so, then aren’t you “tied” to a denomination? Not trying to make a point here, just trying to understand what you’re actually saying. I want to know more about you because you’re one of my favorite rock stars… 🙂 (By the way, I was listening to a “Passion” worship CD tonight in the car and thought of you, because you are a better singer than any of them of the CD!